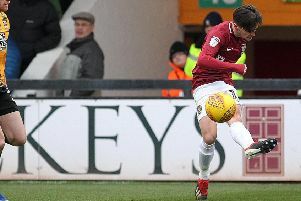 Michael Brown says he believes Port Vale offered Sam Foley a better financial package than the Cobblers to try and persuade him to stay at Vale Park. The player was offered a new contract by the Burslem club, but on Monday Foley put pen to paper on a two-year deal to join Justin Edinburgh at Town. The Valiants boss is sad to lose the player, but accepts and understands Foley’s desire to play at the highest level possible following Vale’s relegation to Sky Bet League Two on the final day of last season. “Sam left with a heavy heart,” Brown told the Stoke Sentinel. “He loves the football club, had the captain’s armband of late and he enjoyed being part of this club. “It is a shame but, he is going to a league one club and that is what we have to understand. “He has missed a lot of football early on playing non-league and he wants to try to progress to the Championship. Abnd Brown added: “We did everything to keep him. “I rang him every day – and his family! He considered it because we had such a good relationship. “I think that’s why we had a chance, as we got on well and he liked the club, but we wish him well.